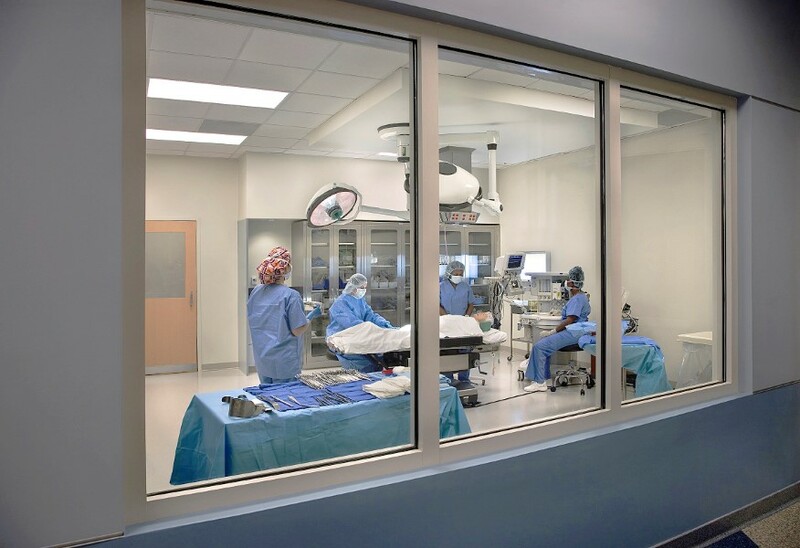 Transparent lab walls enhance collaboration, sustainability and safety. 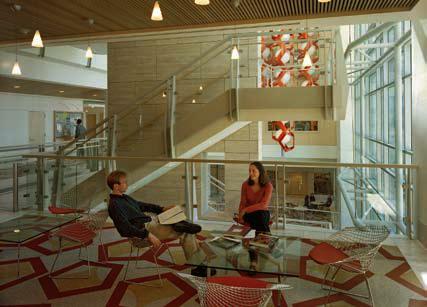 College and universities are making solid walls transparent by using fire rated glass. Modern science is an intensely social activity. The response at colleges and universities is to renovate or build new science labs and medical facilities with open floor plans, shared space and shared equipment. Even with all this openness, there remains an occasional need for walls. Certain types of equipment” such as electron microscopes, tissue culture labs, glass washing, and nuclear mag resonance” need to be in closed labs. And, many researchers want separate offices and conference rooms. Designers recommend that these solid walls also be transparent, in order to enhance cross pollination, increase flexibility, and improve sustainability. 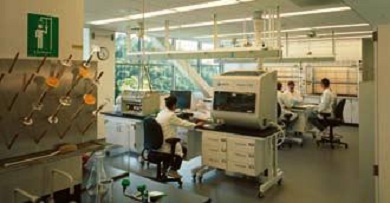 Sustainability is a major concern in labs, because the typical lab uses five times more energy and water per square foot than a typical office building. What happens when there’s a need to add glazing and transparency to an exit corridor, passageway, stairwell, atrium, property boundary, or another location where codes require meeting the ASTM E-119 wall requirements? That’s when and where fire resistive, fire rated glass becomes invaluable. Architects can specify products such as SAFTIFIRST SuperLite II-XL 60-120 clear, resistive glazing that meets ASTM E119 requirements. This state-of-the-art, USA-made glazing provides maximum fire and impact safety with hose stream and full radiant heat protection up to 2 hours. Tested to the stringent wall standard and when used with an equally rated heat barrier framing system such as SAFTIfire GPX this glazing provides floor-to-ceiling and wall-to-wall design flexibility with unsurpassed clarity and sound reduction. Transparency. 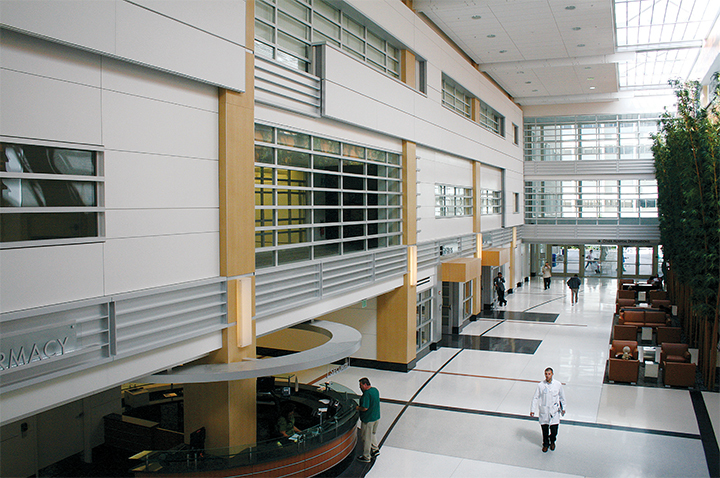 One example comes from a 69,000 square foot renovation of the health-education facility at Central Carolina Technical College. Designers struggled with what type of glazing to put in areas where 1-hr fire rating had to be maintained. They chose SuperLite IIXL 60 in GPX framing, so students could observe instructors and each other in practice labs and mock operating rooms. Collaboration. At University of California, San Francisco Genentech Hall collaboration spaces allow for information interaction. According to Lab Manager Magazine, design that allows researchers and staffers to be more communicative and responsive is a priority, a goal that’s not improved by walls, whether metaphorical or real. Sustainability. In a recent renovation of the university hospital at University of California, Davis, a central feature was a large skylight that allows natural light to vertically enter the atrium area and other light wells throughout the building. In order to also let light flow horizontally into the adjacent hallways, rooms and interior spaces, the architects created transparent 2-hour walls using fire resistive SuperLite II-XL 120 in GPX Framing. In addition to enhancing collaboration, increasing flexibility and improving sustainability, adding glazing in today’s science and medical labs can improve fire safety. Not only are there glazing products that block smoke, flame and radiant heat transfer equal to a solid wall, but there are advantages of transparent walls and large vision areas to first responders.